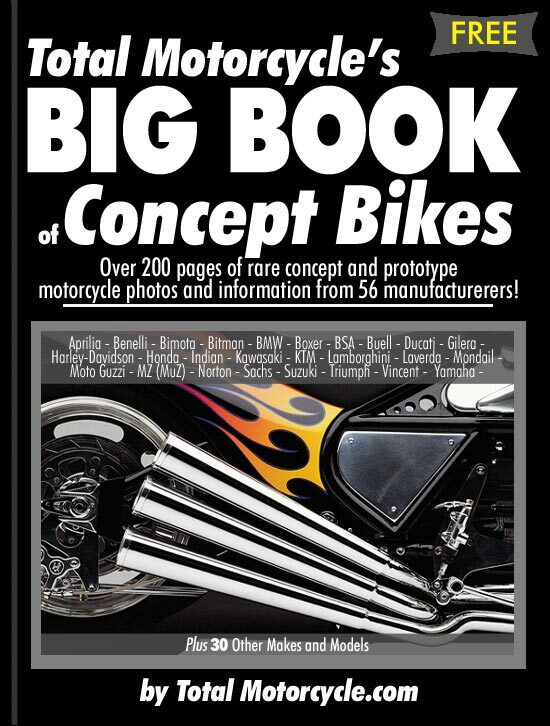 Total Motorcycle’s BIG BOOK of Concept Bikes is the largest collection of concept, prototype, spy shots and rare motorcycle model photos and information on the internet. So sit back, relax and enjoy it all. Total Motorcycle offer the largest collection of concept, spy shots, prototypes and rare motorcycle model photos and information on the internet. 300 big pages, 56 manufacturers, a huge amount of specifications, features and information, plus a huge array of rare photos. Sit back, relax and enjoy it all; Total Motorcycle has you covered! Choose a manufacturer, then motorcycle or scooter model, read the information, click on the pics for bigger sizes and enjoy! Spy Shots, Concept and Prototype Motorcycle, Models including Aprilia, Benelli, Bimota, Bitman, BMW, Boxer, BSA, Buell, Ducati, Gilera, Enfield, Harley-Davidson, Honda, Husqvarna, Indian, Kawasaki, KTM, Lamborghini, Laverda, Mondail, MotoCreations, Moto Guzzi, MZ (MuZ), Norton, Sachs, Suzuki, Triumph, Vespa, Victory, Vincent, Yamaha, Zero and the many independents.